Over the centuries, the Panxian Nasu have, in some places, almost lost their culture and traditional dress. The woman pictured here is wearing a traditional blue dress with buttons on the right and a black apron with streamers hanging down the front. 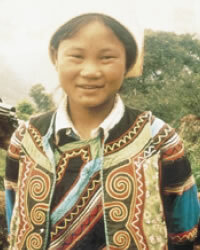 Ninety-one percent of the Panxian Nasu practice their ethnic religions. Ancestor worship is predominant, but spirit worship still exists in mountain areas. There is a strong group of 5,000 Christians among the Panxian Nasu who meet in house churches. They are well liked by their neighbors but have not extended themselves into other villages. There is a great need to preach the Gospel to the Panxian Nasu, and few resources are available. The Scriptures have not been translated into their mother-tongue.